Banner ads or Text ads?Do I need a landing page? Your best prospects, those ready to buy, are searching for your products or services on Google, Yahoo, or Bing. Your website (your internet storefront) must be designed to convert the visitors into buyers. But first you must show up on page one of the internet searches. This may take a rewrite of your website, or special landing pages, along with Google-Yahoo-Bing paragraph ads, banner ads, online reviews of your business, backlinks to your website, or other types of advertising. 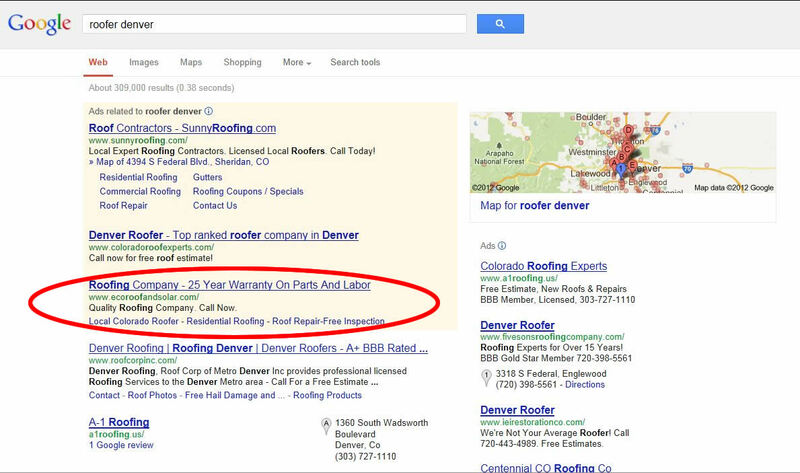 Text ads run in the search results as shown below. Text ads are bought on the Pay Per Click basis where we target 20-200 keywords and run ads targeted for your products or services. Each keyword can have a different bid. They might run 50 cents per click or $10 per click depending on the category and competition for that keyword. Banner Ads (static or animated) can be bought on a PPC basis also.